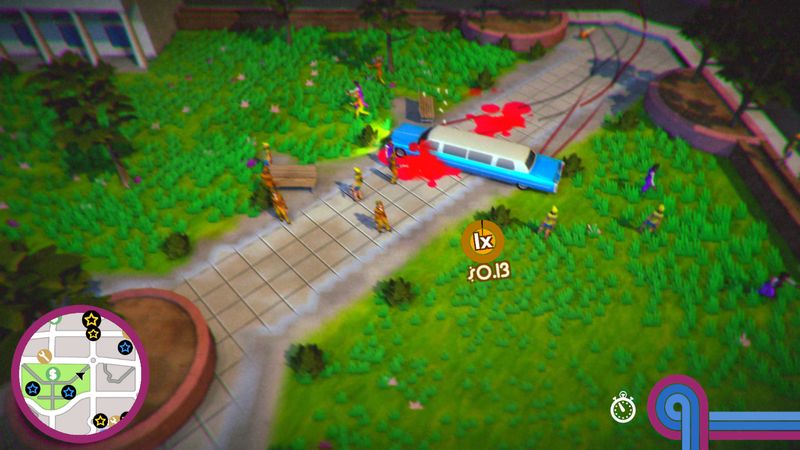 Roundabout was developed and published by No Goblin on Xbox One. It was released on February 20, 2015 for $14.99. A copy was provided by No Goblin for review purposes. Where do I begin when reviewing Roundabout? The absolutely ridiculous ’70s B-Movie FMV cut-scenes? The insane gameplay? The bonkers music and voice acting? Or maybe with the fact that when I beat the game I was at 29 percent completion — not even 30! 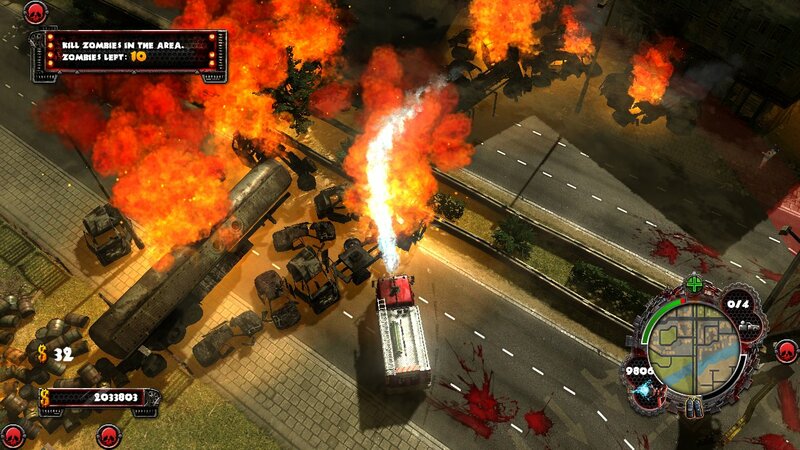 Roundabout is an almost review-proof game, but I’m going to try. In Roundabout, you play as Georgio (of course, played by a woman, because why not), a limo driver who can’t seem to stop spinning. The game has a top-down point of view, and an open world in which you pick up people who need you to take them places and complete wacky objectives. It’s like a cross between Crazy Taxi and the old top-down Grand Theft Auto games — except you can’t stop spinning, which turns everything into a game of figuring out how to maneuver without blowing up. 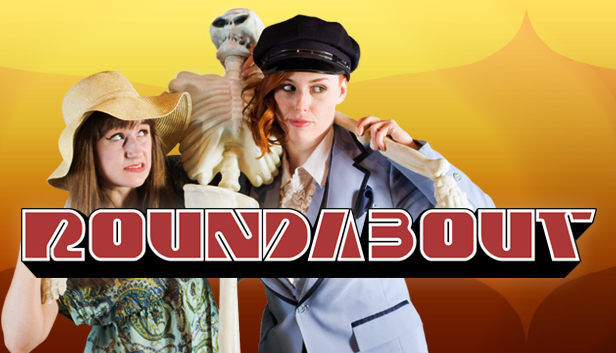 It’s fun — I don’t doubt that there are people out there who wouldn’t agree, but Roundabout is a lot of fun. I also died a lot. A LOT. But it doesn’t really matter. Sure, if you want to get the best scores you need to perform well, but I think I pretty much exploded a minimum of two or three times per mission, and I didn’t care at all. Because the core gameplay is fun and strangely addictive. It’s laugh-out-loud funny — This game is ridiculous. If you’re a fan of grindhouse/B-movie style films, you should love it. There are a ton of cut-scenes that are each more silly than the last, and the lead actress’ deadpan stares — she’s totally silent like so many great video game characters before her — are classic. It’s unique — You simply have never played a game like this before. It’s challenging, but not too hard, and there’s plenty of stuff to unlock. Did I mention that I beat the game with less than 30 percent of the objectives completed? And most importantly, it totally owns its wacky premise and continually finds new ways to put a spin on it (pun completely intended). It’s certainly not for everyone —Some people just won’t get this kind of humor, and they’re not going to get much out of the game. It would be pretty hard to love it if you’re the kind of person who wants ultra-dark seriousness in your video games. Needs more variety — Even though there’s plenty of variety in the missions, it would have been great to have seen more power-ups to mix things up even more. In my time with the game I unlocked slow motion, the ability to jump, and the ability to drive on water. Only after beating the game did I unlock the ability to shrink myself. There’s a few more abilities that can be unlocked later, but it would have been cool if you unlocked them sooner and used them in the core story. Roundabout is probably a game that’s not for everyone, thanks to its wacky, over-the-top premise and purposefully bad acting — not to mention its unorthodox game-play. On second thought, maybe it is for everyone. If you like to laugh, and you like games that are unique, original and fun (and if you’re reading this you probably like all of those things), you should definitely check it out. You’ve never played anything quite like it before.